Losing your hair is a traumatic experience, due to medical treatment from chemotherapy because of breast cancer treatment, cancer, alopecia areata, hormonal changes or another medical condition. For most women, our hair helps define who we are. It's what makes us beautiful. That being said, hair loss doesn’t make you any less beautiful. It makes you stronger. Are you looking for a private, peaceful environment for your hair salon services? Tired of those busy, noisy salons? By appointment only, this is truly an experience and "your private salon". 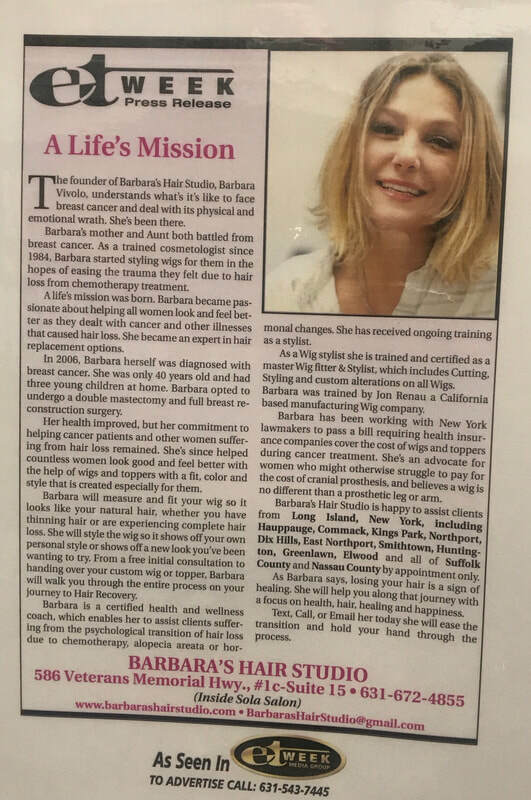 Come visit Barbara and experience a calm relaxing environment to have your hair serviced in this unique setting at the best hair salon in Hauppauge. Barbara's Hair Studio provides clients with human hair wigs or synthetic hair wigs. We also offer toppers for thinning hair to cover bald spots. Whatever your hair loss needs, we'll help you find the perfect wig, wiglet, or top hair for you. We will measure and fit your wig so it looks great, like your natural hair, we will customize your cranial prosthesis (wig), whether you have thinning hair or are experiencing complete hair loss. We style the wig so it shows off your own personal style or introduces a new look you've been wanting to try. From a free consultation to providing you your new custom wig or topper, Barbara is your support system thru your journey from shaving your hair, all the way to your hair recovery and beyond. Barbara’s Hair Studio is here to help you along the way and help you feel good about YOU again. Our founder, a breast cancer survivor herself, understands what you’re going through. From the private consultation to customizing your wig or topper, Barbara our experienced cosmetologist and hair loss solutions expert, will walk you through the entire process. We will journey with you through your hair loss and hair recovery together. Our promise to you is complete customer satisfaction and a forever friendship of health, hair, healing and happiness. Let's do this healing together one day at a time. Our selection of wigs and toppers, and the private, personal salon service we offer, helps women suffering from hair loss regain their confidence so they look good and feel better. We have many styles and colors of wigs to choose from, including selections from world-renown Wig Manufacturer Jon Renau. We offer free in-person or electronic consultations via Skype or FaceTime. We offer hair salon services including haircuts, color and style. Our goal is you feel secure and confident about yourself after your private appointment and walk away feeling good about YOU! ​Barbara our cosmetologist, who is an alternative hair specialist, will give your wig a cut, color and style so you feel better about your hair loss due to chemotherapy from cancer treatment, hormones or another medical condition. We measure and fit your wig so it looks like your natural hair, whether you have thinning hair or are ​experiencing complete hair loss. From the private consultation to handing over your custom wig or topper, we will walk you through the entire process. We are the bridge you may need until your natural hair comes back. 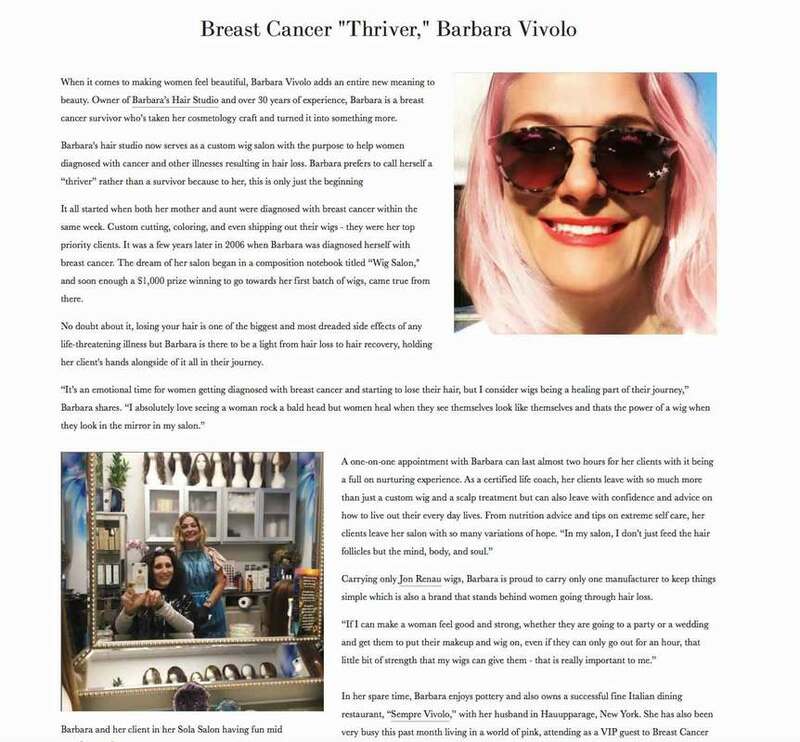 Barbara is also a certified health and wellness coach, which enables her to assist her clients on the right choice of healing foods and how to be in the here and now, so they will have a better quality of life during this most difficult time in their lives. Let Barbara hold your hand and walk this path in a positive direction. Hair loss and cancer is traumatic, but imagine - if you had a hair coach and a health coach to help strengthen you during this time - wouldn't that be great? Healing is the ultimate goal and together we can do it. ​Barbara has been working with New York lawmakers to pass a bill requiring health insurance companies to cover the cost of cranial prosthetic's, during cancer treatment. She's an advocate for women with hair loss who might otherwise struggle to pay for the cost. Barbara will help you fill out your insurance claims so you can be reimbursed for your purchase. We are also happy to offer in home services, nursing homes and hospital visits to help those who can't get to the hair salon. We will travel to you. If our hair looks good we feel good, if we feel good we heal faster. As Barbara says, loosing your hair is a sign of healing. 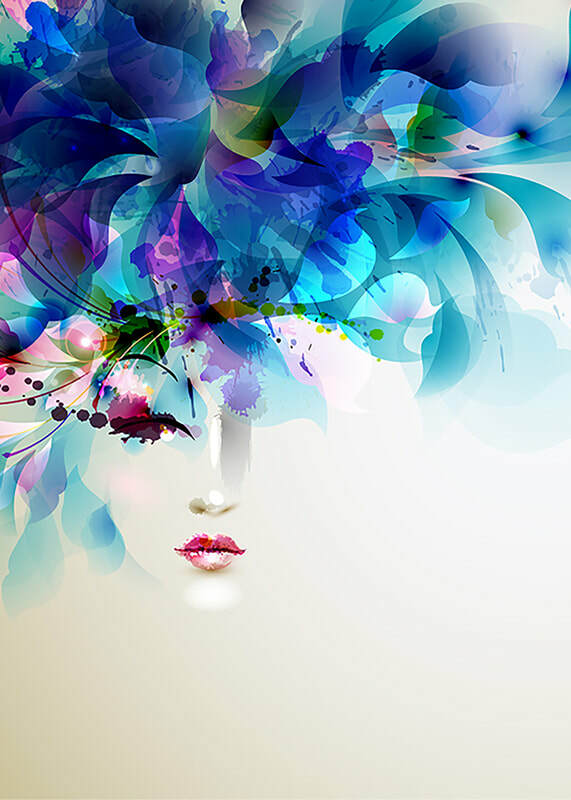 She will help you along that journey with a focus on health, hair, healing and happiness. Pump up the volume with a topper that integrates with your own hair to add body and give you total styling flexibility. Barbara's Hair Studio offers the best Hair Top Piece, Toppers, Wiglets and Wigs. We offer complimentary Skype or Facetime consultations from the comfort of your own home. Just contact us to set up a time to speak with Barbara. We honor your privacy. Are you looking for a private, peaceful environment for your Hair Salon Services? Tired of those busy, noisy Salons in the city. By appointment only, this is truly your private salon. Come visit Barbara and experience the Best Hair Salon in Hauppauge.